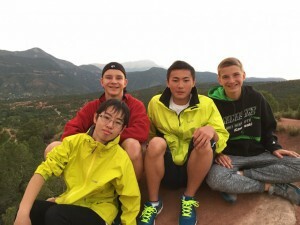 From August 18, 2016, eight middle and high school students from Fujiyoshida in Yamanashi prefecture visited Colorado Springs, Colorado for a six-night homestay on the TOMODACHI NAJAS Grassroots Exchange Program-Colorado Springs and Fujiyoshida. The program included a school visit, a mayor meeting, and various outings to learn about Colorado Springs and the long history of the sister-city relationship. More importantly, the students developed special bonds with their host families and gained first-hand knowledge of U.S. customs and lifestyles. 2017 will mark the 55th anniversary of the sister city relationship between Fujiyoshida in Yamanashi prefecture and Colorado Springs, Colorado. 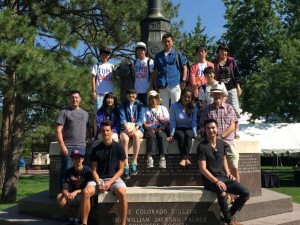 To deepen the relationship between the youth in the cities and to celebrate the anniversary, the Japan America Society of Southern Colorado (through the National Association of Japan-America Societies) and the Fujiyoshida International Friendship Association (FIFA) established this reciprocal student exchange under the “TOMODACHI/NAJAS Grassroots Exchange Program”. This opportunity was eagerly embraced by both cities and attracted numerous applications in Fujiyoshida for the 2016 visit to Colorado Springs and in Colorado Springs for the 2017 return visit. Each city selected eight members, representing the brightest and most ambitious young ambassadors from the cities. This program was implemented by the Japan-America Society of Southern Colorado as a TOMODACHI/NAJAS Grassroots Exchange Program.